Rousing, Indiana Jones’style debut thriller with scheming Nazis, hair-raising escapes, sweeping scenery, and romance in a volcanic cave. Seattle Times journalist Dietrich (Northwest Passage, 1995, etc. ), who won a Pulitzer for his coverage of the Exxon Valdez disaster, goes to the last place left on earth for a WWII-era adventure: Antarctica, where, Dietrich adds in an afterword, Hermann Gîring actually sent a group of German explorers in 1938. 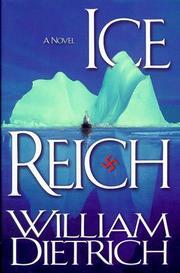 In Dietrich’s fictional account, the Germans take with them American flyboy Owen Hart, whose previous attempt to fly across the South Pole ended in a humiliating failure. Owen, whom we first meet in Alaska after he crashes his plane, knows nothing of the Third Reich’s dark side. Eager for adventure, he goes to Berlin, where he meets Gîring, plays with Gîring’s electric train set, and falls for the beautiful and brainy Garbo-ish biologist, Greta Heinz. Alas, Greta seems to be pledged to the expedition’s commander, the compulsively Hitler-hailing SS Major Jurgen Drexler. Following an uneventful voyage to a continent Dietrich likens to a “dream that stung,” the ship is crippled after ramming an ice pack during an impromptu battle with a Norwegian whaler. The ship ties up for repairs at an uncharted volcanic island, where Owen encounters the creepy ruin of a Norwegian ship whose crew has been killed by a hideous infectious disease. Owen and Greta explore the island, discovering the disease’s antidote just as the Germans begin to become infected. After a tryst in a slime-filled cave, Owen and Greta are separated’she fleeing with Drexler, he forced to return with a bunch of suspicious Norwegians. The story then moves to the closing days of WWII, with Greta and Owen (now reunited) racing back to the deadly island to stop Drexler from using the disease against the Allies. A merry, melodramatic patchwork of adventure films that, when it isn’t evoking predictable cinematic thrills, rivals the page-turners of Alistair MacLean.